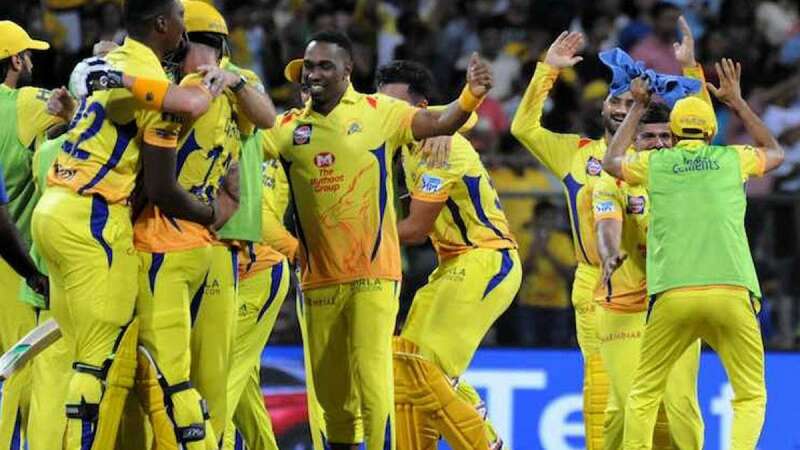 Mumbai : A fighting unbeaten half-century under pressure from Faf du Plessis helped Chennai Super Kings edge past Sunrisers Hyderabad by two wickets in the first qualifier here on Tuesday to enter the final of the Indian Premier League (IPL). Needing 140 runs to win, Chennai made heavy weather of what should have been a comfortable chase before crossing the line with five balls to spare. Chennai have reached the final seven times in the nine seasons they have competed in the IPL. They had missed out on the previous two seasons as they were banned following the spot fixing and betting scandal. Du Plessis batted through the innings to remain not out on 67 runs, with five hits to the fence and four sixes studding his 42-ball knock. The opener kept on playing sensibly throughout even as no other batman clicked at the other end. For Hyderabad, spinner Rashid Khan, Siddarth Kaul and Sandeep Sharma scalped two wickets each. Hyderabad will now face the winner of the match between Kolkata Knight Riders and Rajasthan Royals in the Qualifier 2 on May 25 in Kolkata. Chasing a modest total, Chennai lost their first wicket on the fifth ball of the first over. Wicket-keeper Shreevats Goswami took a brilliant catch to dismiss opener Shane Watson (0) off pacer Bhuvneshwar Kumar. In-form Suresh Raina was playing beautifully, hitting four well-timed boundaries on his way to 22 off 13 balls. But he was bowled by pacer Kaul in the fourth over when he shuffled across and exposed his leg-stump. Off the very next ball, Ambati Rayudu (0) was also clean bowled by Kaul. Rayudu's dismissal was largely due to poor shot selection as he misjudged a slow yorker only to see the ball crash into the base of middle and off-stump. Unperturbed by the fall of wickets, du Plessis kept on playing sensibly. New batsman Mahendra Singh Dhoni (9), then joined in the middle and the duo rotated the strike perfectly. But just when the duo started timing the ball well, leg-spinner Rashid Khan delivered one that turned the wrong way to dismiss Dhoni. With Chennai struggling at 39/4 after eight overs, all eyes were on the lower-middle order But it failed as Dwayne Bravo (7), Ravindra Jadeja (3) and Deepak Chahar (10) went back to the pavilion in quick succession. Harbhajan Singh could only manage two runs off nine balls before being run out. With Chennai in deep trouble, Shardul Thakur gave some much needed impetus to the run rate with three boundaries off the five balls he faced. Thakur, who remained unbeaten on 15 runs, played sensibly and gave the strike to du Plesis. Earlier, lower-order batsman Carlos Brathwaite's unbeaten 43-run knock and some useful contributions from skipper Kane Williamson and Yusuf Pathan helped Sunrisers Hyderabad post a modest total of 139/7 in their allotted 20 overs. Put in to bat, Hyderabad started the proceeding on a poor note, losing opener Shikhar Dhawan (0) on the first ball. Other batsmen Goswami (12), Manish Pandey (8) and Shakib Al Hasan (12) also failed to deliver when needed the most. Brathwaite then came in the middle and played a quick-fire knock and took his team out of troubled waters. He played 29 balls and one boundary and slammed four sixes. For Chennai, Dwayne Bravo scalped two wickets.